How to extend system partition in Windows 2003 Server fast and safely? System partition runs out of space on your Windows 2003 Server? Need to extend the system partition? Don’t worry, in this article, I’ll tell you how to extend system partition in Windows 2003 Server fast and without losing data with Partition Magic Server. 1. Hard disk drive is not big enough to accommodate all your needs, such as software update/upgrade, install programs. 2. Windows operating system is running slowly. 3. 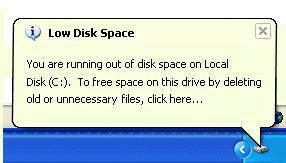 Windows may crash if the free space is extremely low. Microsoft provides Cleanup utility to solve this problem temporarily. 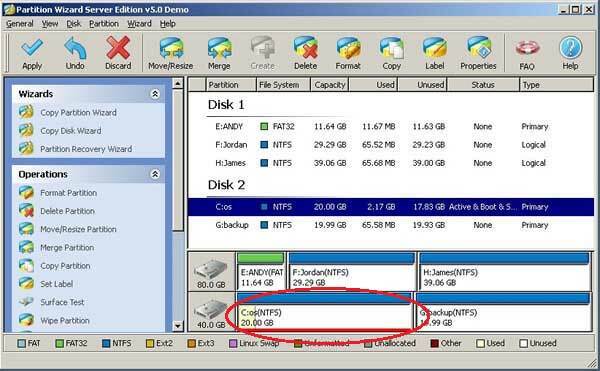 As it can only free up a little free space, you’ll encounter this problem shortly, you need to extend the system partition on your Windows 2003 Server. 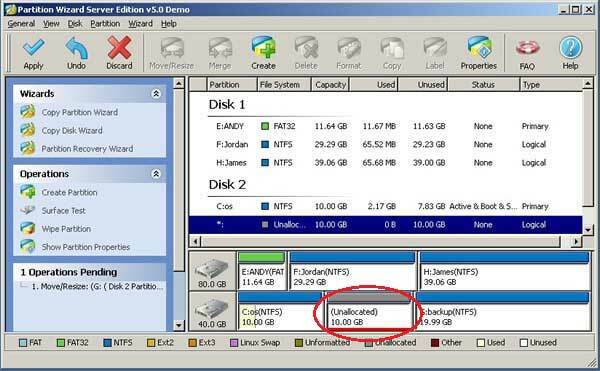 How to extend system partition in Windows 2003 Server? Diskpart.exe, which is a text-mode command interpreter that enables you to manage objects (disks, partitions, or volumes) by using scripts or direct input from a command prompt. For more about this utility, please refer how to extend partition with diskpart. 1. The system volume can only be extended by running Diskpart.exe from a command line by bootable CD. 2. 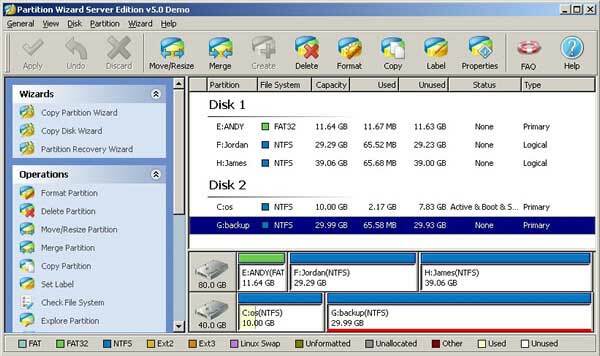 To extend system partition on Windows Server 2003, there must be some unallocated space behind the system partition. Otherwise, you cannot extend system partition with diskpart command. Though DiskPart is free and provides by Microsoft, it is not a good utility to extend the system. 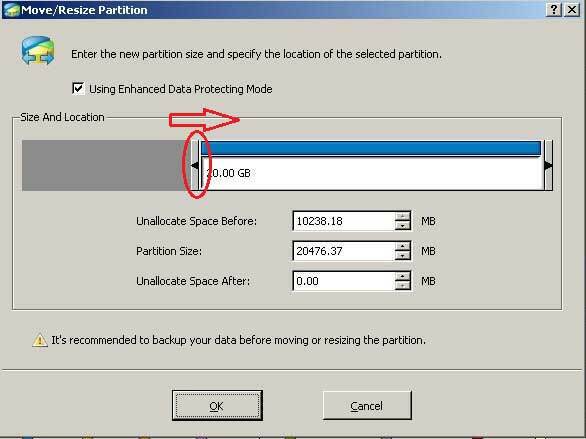 Only when you delete a data partition, you can extend the system partition. It works by command line and hard to use for many users. Incorrect operations lead to data loss and the operations cannot be undone. Stop the Server running for a long time and much more. It is extremely easy to extend system partition by Partition Magic Server. You just need to drag and move on the disk map to resize and extend partition, all operations can be previewed and cancelled. You can even extend system partition in Windows 2003 Server without reboot if it is NTFS. 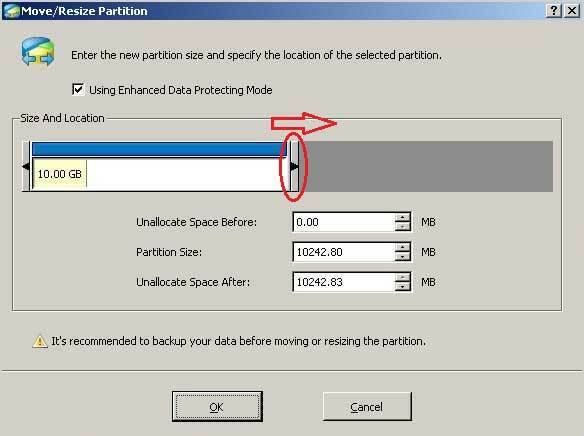 Step 1: launch Partition Wizard, right-click the data partition and select “Move/Resize” to shrink this partition. In the pop up window, drag the left borderline of this data partition rightwards. After step 1, there will be Unallocated space created behind the system partition. 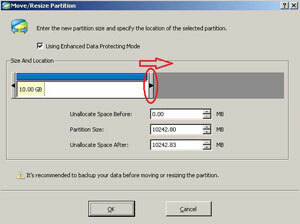 Step 2: Right-click the system partition and select “Move/Resize”. In the pop up window, drag the right borderline rightwards. Now the system partition has been extended, click “Apply”. Enhanced data protection technology helps you resize, merge partition without data loss, even when power off or hardware problem occurred. Hot Resize feature helps you extend NTFS partition without reboot to suspend Server running. Disk and partition copy feature helps you backup data or migrate to another disk without reinstalling Windows. Wipe disk/partition/Unallocated space to protect your data security. Changes made on partitions can be previewed before applying to the hard disk. Easy to use, just dragging and drawing on the disk map to resize, merge partitions. Trusted product, many Fortune 500 companies select it to maintain their Servers.